Original portion by Louis Christian Mullgardt, 1911…and addition by Eden and Eden, 1970s, according to listing agent. Original portion a fine Arts and Crafts house, and addition strongly influenced by Frank Lloyd Wright’s Taliesin East – long cantilevers, corner windows sans mullions, pierced roof openings over balcony, piano hinges on doors, very fine redwood woodwork. Asking $3,500,000 at the time, the property ended up selling for $2,900,000 in January 2011, purchased by “Memsland LLC” which is now proposing to demolish the house and build a modern “green” home on the lot. Over 300 residents of District 5 have written to the Planning Department to oppose the demolition of 226 Edgewood, the only Louis Christian Mullgardt designed home in San Francisco and a property the Planning Department had previously identified as a potential historic resource. A complete teardown of such a home would be a precedent for our extended neighborhood and would set the stage for numerous future demolitions that will alter the character of our beloved S.F. neighborhoods. Edgewood Avenue is a brick-lined street that features a large number of Arts and Craft homes from the early 1900s. 226 Edgewood Avenue clearly contributes in a significant way to the beauty of this unique street and its history. Who is behind the secretive Memsland LLC and the proposed demolition of 226 Edgewood? As a plugged-in tipster notes, that would be Twitter co-founder Evan Williams and his wife, the active corporate officers of Memsland LLC. I’m really tired of people buying nice homes in established SF neighborhoods for lot value. Doesn’t anyone just move into a house anymore and maybe just remodel it? Go build your monster dwell Mcmansion elsewhere. As you know, I have long advocated allowing people to do what they want with their property. But I know this street well. It has long been an enclave for UCSF professors and is a beautiful and private SF neighborhood. Its character really does depend on its historical houses. It is not a suitable place to start tearing down old and worthy houses. There are many houses in northern SF, including PacHts and PresHts that have little architectural merit, and could use a replacement. Tell the Twitter people to come here, and leave Parnassus Hts alone. My favorite street in SF. Agree with conifer that part of it’s character does seem to derive from the older homes (same is true with Belmont and Willard). That said, there is some real garbage here as well. Not this house mind you. There are some modern houses on the street that don’t detract (even a dwell box). All in favor of property owners doing what they want within reason. Do we know what the plans look like? On the other hand, there is a line that is probably crossed at some point when enough of the character is torn down that whatever made this place special is lost. I don’t know where this is. Thankfully I have nowhere near enough money to live on Edgewood and have to worry about this. NIMBYs = the devil until it’s in your own neighborhood. This kind of thing — developers or wealthy new owners gutting and stripping or, as Is the case here, pulling down a lovely old house, has become so ubiquitous that I think there are larger trends behind it than just feckless rich people or greedy developers. My own sense is that it has become so expensive to maintain and periodically rehabilitate old homes that most people just don’t do it. They just use up their houses and when they sell, it’s to either a pro or else to rich folks who have already hired a pro to just build a new house. The folks who sold me my house ran it into the ground and I chose to take the route of fixing it up but it’s a huge burden probably a mistake. You definitely don’t catch any breaks from the city. Those of us taking this road are the last to point fingers at others who sensibly don’t. This does look like a pretty serviceable home but I agree that homeowners should be allowed to do what they want so long as the city approves it. And I also have no issue with neighbors objecting. This is the system the city has setup. I’m a big fan of old homes and old cars, but they both take a lot more work and in the end if you want to live in an older home or drive an older car (especially today when you can borrow money for a new or “newer” one at low rates) you will pay a lot more money and have to spend a lot more time and effort fixing stuff. > a pro to just build a new house. It is not just “most people” it “almost all” business since they don’t have much emotion connected to buildings or vehicles and just get rid of the old stuff and buy new stuff when it makes financial sense (and the old building or vehicle starts costing too much). > mistake. You definitely don’t catch any breaks from the city. > Those of us taking this road are the last to point fingers at others who sensibly don’t. I have owned a few old cars and have often gotten ahead in terms of pleasure vs cost. For instance, a classic I had (Conv Caddy) sold for more than I had paid for it after 5 years. With careful handling there were not many repairs. Every broken stuff I had was because of my personal ignorance (do not attempt to outrun every car at a green light especially with a 500ci engine on a 3-ton car: you have torque but not all parts can stand this long term… ouch). In all, my classic did not cost more than a 10-year old Japanese car even with the repairs. I admit I am still learning (and discovering) on old houses though… It’s a different animal. > a 10-year old Japanese car even with the repairs. > though… It’s a different animal. Daily driver. Roughly 20 miles a day plus 200-300 miles drives 10-15 times a year. Brand new top. Garaged. So Cal weather. 12MPG on a good day. It is a beautiful house, but the owner should be allowed to build a new one, and more importantly, how do you know that what they build will be less beautiful or will not be looked at so fondly as the current structure in the future? The neighbors were handing out a very well-organized info packet about this (it even included a stamped envelope). They seemed especially disappointed about all the trees that would be cut down so maybe there is room for a compromise. wc1: Like “hipster,” NIMBYs are what you call someone *else*. Man, I’ve contended that purchasing property in SF turns people crazy, almost without fail. If it’s indeed the Twilliamses, they already live in a very nice place. I dunno, maybe they feel like they’re slumming it being so close to the MUNI tracks. Yes, the new owners should be allowed to do what they choose with the house, within current zoning and planning laws. That’s what we have currently to work with. If the neighbors dislike this change, then they should get together and buy the property and preserve it the way they see fit. 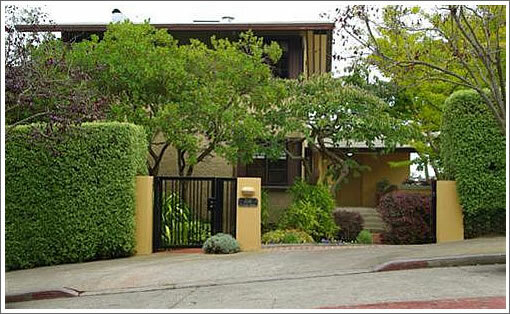 How long did Steve Jobs mess with the Jackling House in Woodside that he wanted to tear down, something like 25 years? Al least Memsland LLC is fortunate that they did not buy on Telegraph Hill, because that might have taken a good deal longer. As an Architect, I feel this is a bit, but just a bit, like buying a Richard Diebenkorn canvass for Ai Wei Wei to paint something new on. The buyers may be Philistines or they may be on the way to creating an iconic landmark. I wish it would just go away, but I am not standing in front of the wrecking ball. And the segway into a senior citizen’s cadillac was hilarious. Honestly, what is green about wrecking so much well built wood and hauling it to a landfill? And whatever the merits of the new design and its greenness, how is this not a misallocation of resources? Obvs as long as they follow building and zoning requirements, the new owners can do as they wish, but enough with the greenwashing of new construction replacing torn-down built architecture. It’s BS 99% of the time! I suppose my vote could be bought if they slid me the Wayne Thiebaud from atop the mantle… but otherwise, no dice. Thanks for focusing in on the “Green” in their statement. I just want to agree that it is extremely anti the philosophy of “green” or sustainable design to think that that some hipster billionaires can for a moment dare imply that it is an improvement to tear down an iconic, functional house to build a new one simply because it might be more green. Green is a cradle to cradle concept, and you will never undo the negativity of “destroying the village in order to save it”. Yes, I hope the wood used to build this house will be reused especially if it is old growth redwood. Tearing down a house and rebuilding it is not green by any means. First a few 10s of tons of gasoline will probably be needed overall to make and carry everything plus the workers and the equipment. Concrete is also very carbon-hungry. The reason someone wants to tear down a house and build a new one is simply the desire/need to have the house that fits them. The rest is just cocktail parties conversation pieces. This situation is a a great example of why aesthetic zoning would be a great idea for certain areas and who the much-derided discretionary review process is so necessary. There are all kinds of neighborhoods where one can build a modernist home, there’s absolutely no need to tear down a wonderful period home in order to say “neener, neener, I have money” to one’s neighbors. But what would some on this site think if I told you I think the north Marina should be one of those aesthetic zoning areas? I happen to love the look of the early 30’s to 40’s design of the neighborhood, and find most of the recent modern additions to be complete failures. These remarks about so-called “greenwashing” sound much like objections to “clean coal”. Of course coal is never green, but some ways of burning it are potentially better than others. The same is true of green homes. If this home were torn down and rebuilt entirely with rainforest hardwoods and no insulation then it would do that much more damage to the environment. This is the green that they are talking about. Everyone who investigates the options seriously knows that building replacement is not the most green alternative, but once that is a given the question is what kind of building will go up and then green is the best choice. One might as well claim that Marilyn Monroe was not beautiful because of the ugliness in her history and surrounding her death. I’d concur with this except that it assumes the people proposing to do a tear down of a vintage home like this one are rational or financially savvy enough to actually make a financially sensible decision. I think in most cases like this one, that isn’t true. Obviously I don’t know the details, not having been involved at all in the transaction, but after reading the above, do I think it’s plausible that the twitter co-founder and his wife got bids on what it would take (if any renovation was indeed required) to bring this property close to their “requirements” and then compared those bids to the ones that came in when they hired an architect to draw up preliminary plans and specs for a new home that met the same requirements and then chose the option that cost less? No. Nothing wrong with having the money. Nothing wrong with building a modernist home. Nothing wrong with a mansion. Nothing wrong with having a housewarming party. Nothing wrong with a photo shoot. Nothing wrong with Vanity Fair magazine, or Dwell Magazine. What is wrong, IMO, is how San Franciscans LOVE to tell others how they should live. Still I do hope the architect will be allowed an “unhappy hipsters” photo shoot for him and his self-absorbed kids. A fake Frank Lloyd Wright that had an addition in the 70s is an irreplaceable neighborhood treasure? Not to mention that there have already been modern conversions done on Edgewood, and the home is almost invisible from the street (I walk past it all the time). And yet, if it were Victorian, it would be off limits to the wrecking ball. It always amazes me how few people have appreciation of period architecture. A few months ago we bought a gorgeous 50’s ranch house in pristine condition – it was featured on the front page of SFGate and in the Chronicle. And in the comments, 50% of the people commented on how beautifully preserved the house was and the other half wanted to gut every last bit of architectural significance. There are plenty of newer houses in that price range in the city. Go buy one of those if you don’t like this one. I agree wholeheartedly that few people have appreciation for period architecture. The idea that a Arts and Crafts house that was influenced by a previous example of the same but wasn’t designed by Frank Lloyd Wright is a “fake” is a great example. There’s nothing wrong with a fine Arts and Crafts home that was designed by another architect. There is something wrong with tearing down a perfectly good period home and building a modernist monstrosity in a neighborhood where it will clash with the surrounding homes to satisfy the owner’s (and quite possibly the architect’s) egoism. @ Brahma: Oh, come on. You and others don’t know that this new home will, in fact, be a “modernist monstrosity”, whatever that means. You don’t know that it will “clash”, whatever that means, with surrounding homes. And you certainly don’t know that the project is being built and designed to satisfy anyone’s ego. Pure speculation, pure hyperbole and really, out of bounds IMO. Agreed with futurist. They should be judged on facts, not preconceptions. This is the place to do something very dramatic. Frank Lloyd Wright wasn’t an Arts and Crafts architect, so gluing a Taliesen-inspired addition onto an A&C home is an interesting melange of styles. If you want to get upset about destroying a “perfectly good period home”, perhaps you’ll want to find an example that’s not already been… reimagined so extensively. As for “modernist monstrosity”, I would humbly suggest that you’re showing a bit of bias. UCSF is in Parnassus Heights, and it has some beautiful examples of modernism. Hey, speculation can be fun. Just like we have periodic “what will be the selling price?” informal contests, why not also play the “what will get built here?” game. My money is on a two story gingerbread Victorian reproduction. Constructed entirely out of brushed stainless steel. I’m betting for mid-century: the mock-up of a Frank Lloyd Wright house like the one from North-by-Northwest. Cantilevered, dramatic, appropriate. 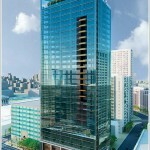 Architect for the new residence is Lundberg Design, whose projects include Larry Ellison’s Broadway manse. Futurist has it right, this is a private residence in compliance w/ neighborhood zoning and the historical review process. The new owner can do as they please. If you want to preserve the house, buy it. Green washing is a red herring and irrelevant. I’m going on the above sentence “the property…purchased by “Memsland LLC” which is now proposing to demolish the house and build a modern “green” home on the lot.” My reading of that in total is, yes, they are going to build a modernist monstrosity. It’s true and a given that I can’t read into the mind the owners, but speculation isn’t “out of bounds”, if it were, there’d be no reason to have these “Look at what local celebrity/rich person X just bought” threads on socketsite, now would there? If I’m wrong about that, please let me know what you the point of these posts are. Frank Lloyd Wright may not have been an Arts and Crafts architect per se, but that movement influenced and informed most of the architects who would become known as the Prairie School. We can argue honestly about how much. lol, the facts won’t be known until the building is built and then it’s too late. I’m throwing down a marker and then upon completion we can judge if I was right or way off base. Who knows, the owners and their architect might prove to have a whole lot of taste, sense of restraint and sensitivity. I’m saying now, ahead of time, I doubt they’ll improve upon what’s on the site right now, addition from the 70’s and all. Same goes for my admittedly unsupported assertions about ego gratification being the underlying motivation here. When the inevitable Vanity Fair or Dwell or Architectural Digest article appears, we’ll see. My personal experience is that it’ll come out from a plain reading of any published interview, because wealthy people, by and large but not always, don’t know and can’t understand when they’re being obnoxious. This couple, with tear-down, opulent-rebuild aspirations seem like yet another example of “new money” people; products of the ever-competitive camp of human activity with little instinct, awareness, sensitivity and/or appreciation to the cooperative aspect of social life. What are they, 40-somethings? Maybe these folks just need more maturing. Or maybe they’ll always be comfortable with a W.R. Hearst-like lifestyle slowly, over time, reflecting more and more on the “Rosebud” alternatives they’ve eschewed. @ Brahma: I’m really trying to understand and evaluate what you are saying but I can’t get past your built-in and preconceived words and perceptions of people and things (houses). -monstrosity:you already hate it and it’s not built yet. -celebrity/rich persons: should we all be poor and unknown? – it’s too late: for what? for some people to be satisfied with the result? Guess what? Not everyone will EVER like what may be built. And that’s ok.
– taste, restraint and sensitivity: extremely subject to the whole planet. And beside, taste, restraint and sensitivity can be very boring. -Dwell, AD and Vanity Fair: guess what? don’t look at the pictures then. -obnoxious wealthy people: and tons of wealthy people in SF who give huge sums of money to our Opera, Ballet and Symphony and the visual arts. Knowing know who the architect will be is a great plus; Lundberg Design will design an amazing, very expensive and very well crafted home, all of it within the guidelines and rules that apply to everyone. We should welcome that kind of architecture in our neighborhoods. Yes, many architectural statements are motivated by ego. Is this a bad thing? Do we need to suppress personality? Do we want to keep older structures and preserve them in their original state like roman ruins because our elders were supposedly “wiser” or had better taste? Nope. Many of the architecturally significant buildings from our part were controversial, and were opposed using the very same arguments. The more things change, the more things stay the same. Out with the (unremarkable) old. We are neighbors who received one of the self-addressed stamped envelopes from the project’s opponents — like everyone else did in our area. To be honest, the photocopied, handwritten letter that came in the package looked a bit like a freaky ransom note. But in any event, it all went straight into the recycle. I mean, give me a break. Nobody has said this project requires a variance; nobody has said this project would block their views; nobody has said this project would encroach upon their houses; nobody has said this project will be out of character for the neighborhood. And this isn’t even a spec developer who will be in and out — it’s someone who wants to live there and be your neighbor. I say let it go. It’s like the opposite of “The Manhattanization of San Francisco:” the Fairfieldification. So, I need to respect art/craft homes because of those who got theirs? AND the UCSF professors too? Privileged neighborhood with a sense of entitlement. Change is BAD! Welcome to the Jungle. @NoeLocal – No one would ever buy a Porsche, take it to a body shop, tear off all the sheet metal and have them remake it as a Mercedes. It’s one thing to change out the rims or repaint it, but if you don’t like that kind of car, don’t buy it. If you don’t like the style of a house so incredibly much that you want to demolish it, then don’t buy that house. @MDfan – they didn’t buy the house, they bought the lot. Btw, what did all those mid-century houses replace in the first place? How can you be so certain that the new design will not improve upon the bastardized original? Same logic applies to the subject house. I will fiercely defend the new owner’s legal right to do what they want with the property, complying with all codes and regulations. So TB, your argument is that because someone in the mid-1900’s destroyed whatever may have been there before, it’s fine for people to do it now? Should we tear down the Painted Ladies because the owners want to build modern? Maybe we could demolish the Flood Mansion because it… you know… so OLD. I’m not saying owners should be barred from legally doing what they want with their homes. I’m saying people should learn some appreciation for historical design and craftsmanship – because most people I know who do, wouldn’t buy something they appreciated and destroy it. They’d find another place to buy. I’m not a fan of Victorian architecture at all. But I have an appreciation for it – and would never think of buying one, gutting it and making the inside in to a West Elm catalog. @MD … funny you should mention West Elm because that seems to be the current style when renovating old homes. 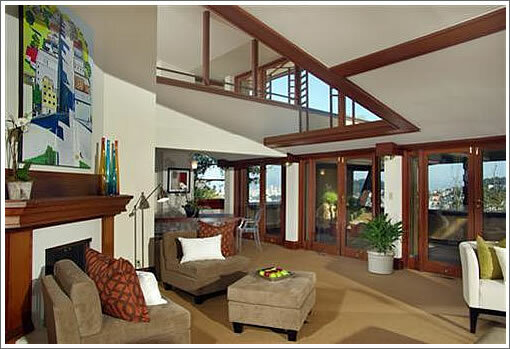 Modern architect designed homes are usually furnished with a style to match the home. Tell me, how can you renovate an old home properly when craftsmanship doesn’t exist anymore? You get generic mass-produced faux moldings. The answer to legalistic objection raised by Tom, NoeLocal and others above about how one would actually address situations like this one is what I posted earlier: certain neighborhoods in The City should have aesthetic zoning apply, so that when people want to build their dwell-tastic modernist home, they have a signal and are encouraged to do so, before they buy, in an area where the resulting home won’t clash with everything else in the neighborhood. TB, you’re factually wrong. Craftsmanship does exist and there are all kinds of subs all over the bay area and the country in general that can make any item you or anyone else would need for a restoration of practically any period home. People decide to rip these homes down to build a dwell-tastic one because they want to, and saying that “craftmanship doesn’t exist anymore” is a pretty lame excuse. Just to be clear, there are valid reasons why someone can’t restore a period home. But millwork isn’t one of them. What “certain” neighborhoods? Only the rich ones? How would we(Planning) go about that determination? What exactly is “aesthetic zoning”? We already have the Residential Design Guidelines in place; they work well, without defining specifically what is and is not allowed. Who determines what may “clash” or not clash with a neighborhood? See Residential Design Guidelines, again. There will be as many definitions of clash vs not clash as there are residents in The City. I don’t get the “dwell-tastic” comment place in this discussion. Many people love this modern style and they sell well in SF, as a new, functional home. Some people don’t like them, but they have a place. I understand you may not like this style, but may not like Classicism, or Victorian or Craftsman, or Streamline Moderne. These styles are all mixed among other styles in our neighborhoods, pretty much across our city. What process would we use to exclude some styles, such as “Dwell”, and include others? In reality, great streets and great neighborhoods are made up of a rich mix of architectural styles, colors, shapes, and materials; all contributing to a city that reflects its’ diversity of occupants. futurist, I’m familiar with the Residential Design Guidelines, obviously the occurence of the above-mentioned situation means that they aren’t comprehensive enough or don’t work “well”. Although I realize you don’t agree (because you keep employing the scare quotes), some folks do think that there is something to the idea that the design of a new home can clash significantly with its surroundings or that an existing traditional home shouldn’t be torn down to facilitate building a new one. The fact that “over 300 residents of District 5 have written to the Planning Department to oppose the demolition of” the above home is evidence of that. As examples, I would not tear down the painted ladies to enable a concrete, steel and glass Saitowitz special or an abomination like 611 Laguna Honda or allow a project like 802-808 Steiner. Obviously, the current planning commission thinks the way you do. Aesthetic zoning would be one way to address the objections raised by property rights maximalists like NoeLocal above, by establishing a neighborhood style before new buyers make their decisions. I agree that lots of people seem to like dwell-tastic homes, and that they sell well. On the other hand, how many new Arts and Crafts homes (just to cite a relevant single example here) are being built? If the overwhelming majority of new SFH’s are dwell-ified, does it mean much that they sell well or “are popular” in the context of the market share for new construction? The difference between us is that you chose to deride those who think there are some areas where dwell-tastic homes are perhaps inappropriate or ill-advised, and so you repeatedly attack the very idea that a design can clash with its surroundings. Let’s just agree to disagree on that point, okay? My comments had no derision or even hit of derision in them, and attacking an idea is perfectly acceptable here, vs. attacking the person. I even mentioned your previous comments were well intended. I simply use quotes to emphasize a particular previous quote or idea; I don’t know how they can be seen as “scare” quotes. There I go again. And no, I can’t really agree to disagree with you that design can clash with the surroundings. I don’t know what that means. I can’t see it. I can’t understand it. While I don’t like a lot of the work of Saitowitz, for the harshness and lack of livability (my opinion) I would not ever exclude a particular architect’s work from our urban environment. It gets back then to who do we include and who do we exclude. Again, to reiterate, I do feel the Residential Design Guidelines work well without defining what is and what is not an acceptable style. To even begin the discussion of establishing a so called “aesthetic zone” starts down a very slippery slope. Some of the best (worst) examples of aesthetic zoning are in the gated communities of, say, Orange County or Contra Costa County. That’s what you get when narrowly defined styles are required. Never will happen here in SF. Well, that’s certainly a spirited and interesting point of view. …Continued from my 1st post: To explain my venting/ranting re: costs of living, (as if the whole demolition of something historically valuable isn’t enough right there)… …Hell! With these over-paid nit**** flooding the City that are able to just ‘slap-down’ well over 2½ Million bucks “for a lot”… NO WONDER a loaf of Generic low-grade bread costs in the upwards of $2-$3! Ever dawn on anyone why rents are so $$$$$$$$$$? Yeah, Supply-On-Demand, needless to say. HOWEVER! There are other factors too. TAXES, “SPECIAL ASSESSMENTS”, etc. cost big bucks. ESPECIALLY to properties (of ANY scale from a dinky R-1 Single-Family Dwelling right on up to the out-of-scale Ionic Breeze monstrosity located at 1 Rincon and everything in between) that were and are sold in the last decade or so… The HIGHER the TAXES… THE HIGHER THE RENTS! Just TRY doing ANYTHING Event-Related in this town. If ya haven’t… YOU need to! That’s unless You CAN’T afford to! To those out there that understand what I’m saying… Thank you! PLEASE TRY to relay ANY insight to the minds of the PLENTY ‘unaware’ Folk that surround us. 🙂 Peace to ALL! You certainly are full of energy and disdain for a lot of San Francisco. You forgot to mention the bike issue. Guess what? this is an expensive city because it’s very desirable. Desire drives up demand, which drives up prices. Plus we have a lot of educated, high income people here. Nothing wrong with that. And,one more thing: The fact is, living here is a privilege, not every one can. That’s life. If you want to live in an affordable city try Detroit. Wow, there’s rant and there’s rant. This is a new milestone, lol. I doubt the construction will be “zero net energy” as well. But one can always dream. Another “living off the grid” project, lol. They’ll get bored of it very quickly, like Clooney and his Tesla (not that there’s anything wrong with Teslas). I give them 2 years before they move to PH like everyone else who hasn’t realized yet what gazillions can buy. One might as well claim that Marilyn Monroe was not beautiful because of the ugliness in her history and surrounding her death. These remarks about so-called “greenwashing” sound much like objections to “clean coal”. Of course coal is never green, but some ways of burning it are potentially better than others. The same is true of green homes. If this home were torn down and rebuilt entirely with rainforest hardwoods and no insulation then it would do that much more damage to the environment. This is the green that they are talking about. Everyone who investigates the options seriously knows that building replacement is not the most green alternative, but once that is a given the question is what kind of building will go up and then green is the best choice. Absolutely, and it is the choice of the owner to tear down and rebuild. Doing it green? That’s great. But slapping a big green badge is hypocritical because this very decent house could have had another 50 years or more of happy use. Nonetheless, we need to recognize the generations before us have been very short-sighted. We’ve wasted heaps of resources, some of which will not come back (for instance almost all the old-growth redwoods are gone) and the result is what we have today. We need to respect that as much as possible and leave something to our grand kids.